Audi is once again setting standards in the full-size class with the new seventh-generation A6. 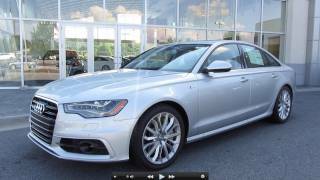 With a broad portfolio of innovations and a lightweight body featuring numerous aluminum components, the Audi A6 2012 is destined to write the next chapter of the A6 success story. Audi is once again setting standards in the full-size class with the new seventh-generation A6. 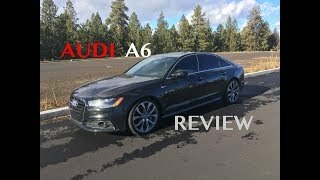 With a broad portfolio of innovations and a lightweight body featuring numerous aluminum components, the sedan is destined to write the next chapter of the A6 success story. The design of the A6 stands for athleticism and elegance. The sedan is 4.92 meters (16.14 ft) long and 1.87 meters (6.14 ft) wide, but just 1.46 meters (4.79 ft) tall – the sportiest proportions in its class. The long hood, the low, taut roofline and the distinctive lines on the flanks create a dynamic overall impression. Up front, optional LED headlights underscore the distinctive appearance. Thanks to an intelligent composite construction concept, the body is extremely lightweight, rigid and safe. The numerous aluminum components and the high-tech steels reduce its weight by roughly 30 kilograms (66.14 lb) compared to its predecessor, making the body the backbone of a consistent lightweight design concept. Depending on the version, the new business sedan is as much as 80 kilograms (176.37 lb) lighter than the previous model. Audi, the pioneer of lightweight design, has once again reversed the weight spiral and thus established new standards. The A6 2.0 TDI has a curb weight of just 1,575 kg (3,472.28 lb). The body offers additional advantages, too. Modern materials and construction methods provide for a very low interior noise level. The precise matching of all components and systematic hydraulic damping in the axle and drivetrain bearings provide excellent vibration comfort. The spacious interior of the new Audi A6 takes up the sinewy style of the exterior design. Its salient element is the “wrap-around” – a decorative inlay encircling the driver and the front-seat passenger. The elegant face of the instrument panel emphasizes the tension of the cockpit. Every interior detail documents the care with which Audi builds cars. All materials, including “Beaufort oak,” an innovative layered wood veneer to be introduced later, are carefully selected and processed. The front seats are available with optional ventilation and massage functions. The ambient lighting or the interior lighting package accent the interior with tiny highlights. The new Audi A6 features the intuitive ergonomics concept that characterizes all of the brand’s models. An efficient deluxe automatic air conditioning system and the MMI radio advanced control system come standard. The MMI navigation plus system with MMI touch is available as an option. Many features of the hard drive navigation system can be controlled via the touchpad. Audi offers an optional head-up display that projects important information onto the windshield. Audi offers the new A6 with a choice of five powerful and highly efficient four and six-cylinder engines. The two gasoline and three TDI engines produce between 130 kW (177 hp) and 220 kW (300 hp). All engines use key technologies from Audi’s modular efficiency platform – the innovative thermal management, the start-stop system and the recuperation system. Compared to the previous model, fuel consumption has been reduced by as much as 21 percent – a top mark in its class. The most efficient engine in the lineup is the 2.0 TDI, which will be available somewhat later. When paired with the manual transmission, it consumes only 4.9 liters of fuel per 100 km (48.00 US mpg), which corresponds to only 129 grams of CO2/km (207.61 g/mile). The A6 hybrid will follow later. Its 2.0 TFSI and the electric motor produce a combined 180 kW (245 hp) for sporty performance. Average fuel consumption is just 6.2 liters/100 km (37.94 US mpg) (preliminary figure). 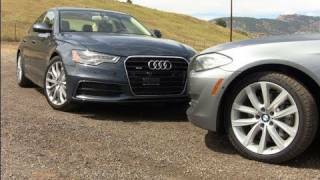 Audi offers the new A6 with a wide range of drivetrains. Depending on the engine, the choices include a manual six-speed, the continuously variable multitronic and – new in this model line – the sporty seven-speed S tronic. With their wide gear spread and low internal friction, all engines make major contributions to efficiency. Power is delivered to either the front or all four wheels, depending on the engine. The latest evolution of the quattro permanent all-wheel drive system features a crown-gear center differential and torque vectoring for superior traction, stability and dynamics. Models featuring the top engines will be available somewhat later with the sport differential, which actively distributes the power between the rear wheels. The chassis of the new A6 combines superior comfort with sporty precision. Its links are made of aluminum; the power steering features a new electromechanical drive for high efficiency. The big sedan rolls on wheels measuring between 16 and 20 inches in diameter, behind which are powerful brakes. 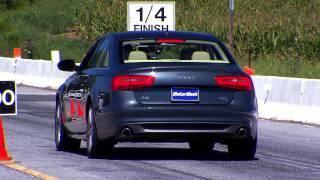 The Audi drive select driving dynamics system comes standard with all engine variants. Audi can also deliver the comfortable adaptive air suspension with variable damping on request. The optional dynamic steering will be available somewhat later. The online services, on which Audi is collaborating with Google, connect the A6 to the Internet via the online Bluetooth car phone. A UMTS module pulls images and information from Google Earth up on the monitor and integrates them with the navigation route. A WLAN hotspot provides contact to mobile devices on board. Other attractive functions to be added in the near future are voice-activated Google POI search and up-to-the-minute Audi online traffic information. Topping the line of hi-fi options is the high-quality Bang & Olufsen Advanced Sound System. MMI navigation plus works intensively together with the optional driver assistance and safety systems in the new A6. It forwards the route data to the control units for the headlights, the automatic transmission and the adaptive cruise control with stop & go function. This enables these systems to recognize complex scenarios and support the driver. The Audi pre sense safety system can in many situations reduce the severity of accidents and their consequences, or even avoid them all together. The Audi active lane assist helps the driver to keep the A6 on course, and the park assist system relieves the driver of the chore of steering when parallel parking. The Avant in the A6 model series is a winner. It impresses with a generous and elegant body, a sporty interior, a balanced chassis and sporty, yet efficient engines. With the refined lines and perfect craftsmanship, the spacious interior has the feel of a luxury lounge. Split-folding rear seats are standard − this allows trunk space to grow from 565 to 1,660 cubic liters (19.95 – 58.62 cubic ft). Four gasoline engines and five TDI engines are available for the A6 Avant. The 2.8 liter, V6 gasoline engine is equipped with the Audi valvelift system for greater torque. The efficiency champion of the model line is the Audi A6 2.0 TDI e, whose 100 kW (136 hp) diesel engine consumes on average just 5.3 liters of fuel per 100 km (44.38 US mpg). Power from the engines is transmitted to the front wheels – or to all four wheels – via a six-speed manual transmission, the user-friendly tiptronic or the continuously variable multitronic. Audi offers quattro all-wheel drive for all engine versions developing a minimum of 140 kW (190 hp); it is standard with the two most powerful engines. The chassis of the A6 is based on a four-link front suspension and trapezoidal-link rear suspension. The optional adaptive air suspension enables the driver to switch among four settings to vary the adaptive dampers’ performance and characteristics. Modern assistance systems make driving even more relaxing. The multimedia systems are likewise state-of-the-art. The A6 allroad quattro is at home on any terrain, and comes with powerful engines to deal with any conditions. There are three units in the engine lineup. All engines are paired with the tiptronic transmission, with a six-speed manual available as an option for the three-liter diesel. 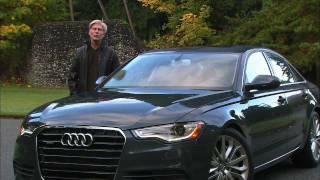 quattro permanent all-wheel drive and the air suspension are standard in all models. The adaptive air suspension makes it possible to raise or lower the body's ride height by as much as 60 millimeters (2.36 in). It also offers a choice of five driving modes – from “dynamic” for the highway to “lift” for rough terrain.